77 YO Teacher Beulah of St Josephs Secondary school continues to educate underprivilege student. Whether Rich, Poor, Underprivileged or Special needs, there is absolutely no discrimination at the School run by this exceptional 77 Yo teacher. Founder of St Joseph’s Secondary School, secunderabad. For decades, teacher Gabriel has taught low-income youth at St. Joseph's Secondary School, Secunderabad. This school was founded by her 25 years ago with the purpose of providing opportunities for the children of the people underprivileged. But this exceptional educator's teaching experience spans the high school and university levels, accumulating more than 45 years of academic experience. Mrs. Beulah was born into a family of professionals. Her engineer father and a doctor mom, both were concerned about spreading their knowledge among disadvantaged people encouraging them to study. 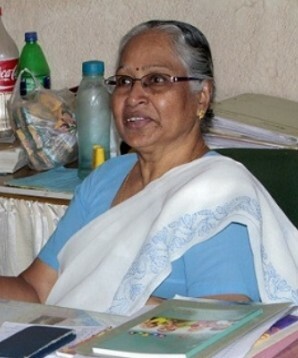 Her mother encouraged girls from Secunderabad to study nursing at home. This experience had a huge impact on Beulah’s life. Professor Beulah Gabriel celebrates her 77th birthday in 2018 and St Joseph's High School celebrates the 25th anniversary of its founding. Both celebrations span great accomplishments. St. Joseph's graduates are men and women who achieved their dreams from the academic and moral teachings they learned in the classroom. One of her graduates said:”I’m Samuel Thapa, a proud alumnus of St. Joseph’s Secondary School (SJSS). I graduated in class ten in the year 2006 after spending my most important twelve years of growing physically, socially, and mentally here. I’m also grateful to our principal Mrs. Gabriel who meticulously prepared us for everything in life, and also maintained school spirit, high standards, diversity, and discipline.” As this testimony, there are hundreds of expressions of appreciation for the educational work performed by Mrs. Gabriel. Mrs. Gabriel accumulated extensive high school experience before founding St. Joseph's Secondary School. She knew firsthand the difference in the quality of private and very expensive education and public education. As a teacher, she decided to work to bring about change in the education of the underprivileged and made a commitment to educate those most in need. Mrs. Gabriel's strategy involved the coexistence of students from the upper classes, poor students, and even students with special needs. In this way, the school can provide scholarships to poor students and provide them with the best quality education. The strategy had excellent results even in cases of special young people. Hundreds of parents of the special needs children are ever so grateful to this school. Professor Gabriel considers that the concurrence of students from different social levels in the same school induces the exchange of experiences. In the school coincide, children of professionals, of rickshaw pullers, and of workers from different areas. Consequently, the students represent various segments of the population of Secunderabad and due to the coexistence during the school years, the objective of promoting the integration of society is achieved: “I wanted a school where children from all walks of life–from the richest to the neediest, from highly educated families to first-time school goers could study together,” says Gabriel. One of Professor Gabriel's goals in founding St. Joseph's Secondary School was to establish an open-door policy. She set out to differentiate herself from other schools that subject applicants to entrance tests where not only the children are assessed but also the educational and economic level of the parents. She ensured that no child was sent back regardless of the results of the tests or the parents’ background. At St. Joseph's students are evaluated to establish the academic areas they need to reinforce and then design a personalized strategy to overcome those weaknesses. Through the personalized attention of each student, Ms. Gabriel transforms a student's academic weaknesses into strengths. The foundation, management, and transcendence of a school directed to the attention of children coming from diverse social classes represent a major challenge. Professor Gabriel undertook the task of founding an open-door school, assuming the demands that an educational institution requires. A school demands attention to building, to teachers, to the administration of finances, to the curricular content and fundamentally to children and young people. All this under the responsibility and optimism of a woman committed in soul and life to the future of the young people of India. The team of teachers and workers who accompany Mrs. Gabriel in this titanic task is stimulated every day with the optimism and commitment of the tireless teacher of several generations. The vocation of the teacher Gabriel even led her to sell the house that her son gave her, to finance St Joseph's Secondary School. This family’s sacrifice expresses the deep love for education rooted in this teacher's soul. That deep love for the noble teaching profession was inherited by her son Gerard Gabriel who teaches at St. Joseph's and currently promotes a sponsorship program for individuals or institutions to financially support the education of a low-income child. The graduates of St Joseph's Secondary School are the most beautiful expression of the achievements made due to the teaching vocation of a Teacher whose history will be legendary in Secunderabad and source of inspiration for all of India.